← SXSW Filmmakers, Start Your Engines! 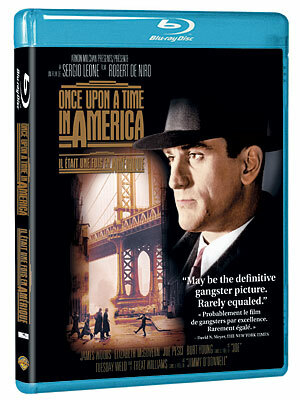 Warner released Once Upon a Time in America on Blu-ray in Canada on January 11, 2011. Help support Toronto Screen Shots by buying it on Amazon.ca. Approximately an hour in, young gangster Patsy (Brian Bloom) climbs the stairs for an assignation with teenaged prostitute Peggy. He’s been told he can exchange a freshly-baked creampuff for sexual favours and as he waits for her, he sits on the staircase while gingerly placing the creampuff next to him. Over the next two full minutes, he sits looking at this delicious treat while waiting for one of a different sort. He picks at the icing and rearranges the wrapping nervously until he finally can’t help himself any longer. He greedily devours the creampuff, and just as he pops the cherry into his mouth, Peggy emerges from her apartment. “Whaddya want?” she demands. “Uh…I’ll come back another time.” I don’t think I’ve ever seen a better portrayal of the fine line between childhood and adulthood, and in a shorter film, this is the sort of scene that would be cut first. I won’t attempt a full review, but Leone’s tale of Jewish gangsters in New York spans more than 30 years in the lives of pals Noodles (Robert DeNiro) and Max (James Woods). The often-overbearing soundtrack by Ennio Morricone piles on to the already-sentimental direction by Leone, but it’s a good story and some of the images are just fantastic. The film also stars Joe Pesci, Tuesday Weld, Elizabeth McGovern, Treat Wiliams, Burt Young, Danny Aiello and in her first film role, Jennifer Connelly. Extra features include a commentary by film critic Richard Schickel and an excerpt from the documentary Once Upon a Time: Sergio Leone focusing on the making of the film. It runs about 20 minutes. This entry was posted in DVD and tagged gangsters, newyork, newyorkcity, nyc. Bookmark the permalink.